Added sugar is everywhere you turn in America. 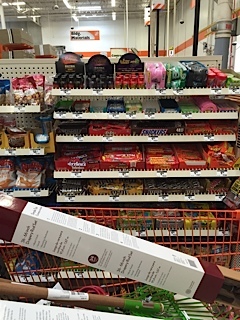 The skeptical cardiologist visited Home Depot recently to buy a rake and was confronted by row upon row of candy and processed treats at the check-out counter. I’m pretty sure I could have raked leaves for an hour and not burned off the useless calories from one of those Kit Kat bars. Whole Foods, self-proclaimed “America’s healthiest grocery store” always has vast rows of useless “function drinks” full of added sugar (and useless chemicals) prominently displayed at strategic spots throughout their stores. The easy target in the battle against obesity and cardiovascular disease would seem to be added sugar. Sugar-sweetened beverages, which have no nutritional value and just contribute empty calories, are easiest target of all. How can we convince our patients to reduce added sugar consumption? One approach that has been suggested is to tax added sugar in some way. Voters in San Francisco and Berkeley today are deciding whether their communities will impose a tax on sugary beverages. In San Francisco this would be a 2 cent tax per ounce on any beverage that contains added sugar and 25 or more calories per 12 oz. Prop. E would levy tax on some juices, coffees and flavored waters and would raise more than $31 million a year. The money would go to children’s nutrition and physical education programs. The soda industry has spent 7.7 million dollars in San Francisco fighting this with a heavy marketing campaign. The feeling is that if such a measure passes in one city, it could spread across America. Readers of this blog know that I consider sugar not fat as the major toxin in our diet, contributing to obesity, diabetes and ultimately heart attack and stroke. I’ve also pointed out that huge amounts of added sugar that are hidden in smoothies, coffee drinks, and non fat yogurt. I’m a huge advocate of not consuming these types of beverages but I’m not convinced that this tax is the right approach. We certainly have a precedence for taxing products which individuals consume that science and society agrees are harmful such as alcohol and tobacco. Added sugar is different in that there are so many different vehicles for its delivery. Will taxing soda result in more candy and donut consumption? I’d like to see one or both of these measures pass and hopefully we can monitor closely the results in these northern California cities, gathering data on overall sugar consumption as well as sugar-sweetened beverage consumption. Hopefully, measures like these will lead to greater consumer awareness of the problem of added sugar and reduction in its consumption. I hope your comment was in jest because it is so hard to ingest! Seriously, the backers of the sugar-sweetened beverage (i have just coined the acronym SSB for this) tax (which, by the way, passed in Berkely but not in San Francisco) are pushing both the carrot (money to spend on improving health) and the stick (penalty for buying soda) aspects of this. We will be able to observe what happens to the money in Berkely and whether it accomplishes anything and whether Berkelyites (?) consume less SSB.